As the Sun trines Neptune today, you may be feeling more sensitive, more intuitive, and more aligned with the inner-workings of your psyche. This transit can bring in psychic impressions, such as astral travel, lucid dreams or déjà vu experiences. While that may be a bit unnerving for you at first it can open up doors for you that you never dreamed possible. The High Priestess is a strong feminine energy — regardless of your gender. It speaks of feminine strength and wisdom and all the secrets of the universe unveiled. 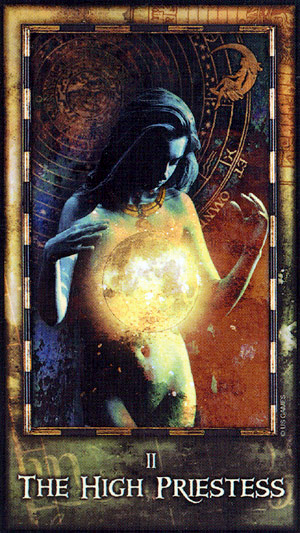 We see the Priestess in this card standing before the esoteric symbols of an astrological chart, with the glowing orb of the full moon at before her. It appears to be hovering in mid-air while she gazes into it, divining her / your / our future. She is both young and old, embodying both innocence and wisdom at once. A lunar goddess rests in the crescent of another moon behind her. You may be getting more in touch with your own intuition, or thinking about delving into the mystery schools — learning tarot, astrology, numerology, etc. Or you may find yourself experiencing profound instances or deja vu or synchronicity. You may also be experiencing bursts of creativity and inspiration. Another possibility, one that comes unexpectedly, is a sudden onset of clairvoyance or psychic impressions. It’s important to embrace these visions and try to understand them, rather than shying away from them. 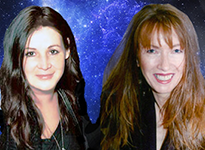 They can bring incredible insights into not only your own personal choices, but also into the direction you need to be heading in order to achieve your goals over the next several weeks. The card used for today’s tarotscope — the High Priestess — is part of Archeon Tarot by Timothy Lantz. The Archeon Tarot was published by US Games. Please be sure to visit and “like” this deck’s Facebook fan page, and follow it on Twitter. For more information on Timothy Lantz, please visit his website.